Today I sat up near the Hillsboro, OR airport and tried to explain the NextGen of ATC to my step-son Micheal, himself a wannabe student pilot. Next to me – smiling and giggling as always – was his daughter and my first grandchild, Caitlin, all of 10 months old. We had flown in for a quick dinner visit in the Katyliner, which is far from what we know today as a "glass" aircraft. I explained that by the time Caitlin is old enough to solo, the vast majority of the GA fleet will have glass cockpits, something that will be vital to the successful implementation of the next generation of air traffic control. I told Michael that today, it is critical for primary students (in my humble opinion) to learn glass right from day one, because that is the future of GA. And I told him that of all the CFIs I know, there was one in particular that excels at teaching glass. At Airventure recently, I enjoyed some fast Italian food with Max Trescott, the 2008 National CFI of the Year. Max is about as nice a guy as you can find in GA, humble as myself but oozing with glass cockpit knowledge. He has mastered this glass realm with such zeal that he's built a book publishing empire based on teaching glass cockpit management to the masses. If you every need help in this area, the only stop you need to make is at his website. 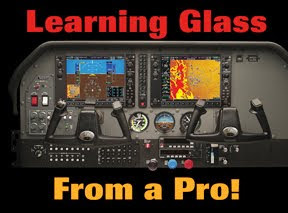 Recently, Max provided World of Flying with a set of detailed answers about glass, being a CFI, technology and his cat. Part one of this interview follows, where we look at how this Silicon Valley high-timer ended up chasing airspeed with low-time flight students in California's Bay Area. World of Flying: Tell me your background, how many hours, what ratings, type ratings, aircraft flown, when you got your license, all those details. Max Trescott: I started flying when I was 15 years old. I didn’t have a driver’s license at the time, so my mother used to drive me to the airport, outside of Wellsboro, PA. I finished my Private when I was 19. In college, I received degrees in electrical engineering and Psychology. Then I went to work for Hewlett-Packard. I worked there for 25 years in a variety of Marketing, Sales and management positions. During that time, I continued to fly on weekends and earned my instrument, commercial, multi-engine and CFI ratings. I took my CFI checkride on September 10, 2001—and then was unable to exercise the privileges for 2 months due to 9/11. I taught flying on weekends and added my MEI and ATP certificate. After I left HP 5 years ago, I started a small business I’d been planning. But after two months I decided that I didn’t really like that industry, so aviation became a full-time career. World of Flying: What was it that made you decide to become a flight instructor? Was there any one incident, or a lifelong dream? Max Trescott: My decision to get my CFI rating was very serendipitous. At the beginning of the summer of 2001, Tim Johnson, a friend of mine who has since moved to Florida, said “Max I’m getting my CFI and you should too.” Since I’d just entered an uncharacteristically slow period at HP, I thought “What a good idea!” I’ve always looked for ways to raise my aviation game to higher levels and getting the CFI rating—which I’d never really considered before—seemed like a good way to do that. Thank you Tim! World of Flying: Explain the details of the 2008 National CFI of the Year award, who gave it to you, what it meant to receive the award, and how (if any) the award changed your professional life. Max Trescott: The General Aviation Awards program is sponsored by about 20 different GA companies and organizations. It’s designed to recognize CFIs, avionics technicians, A&Ps, and FAA FAASTeam safety counselors. The process starts with local FAA FSDOs. There are more than 60 of them and they’re encouraged to nominate candidates. Jack Hocker, the FAASTeam Safety Manager at the San Jose FSDO nominated me. Jack knew me well as I’d presented many Wings program safety seminars in the San Francisco Bay area. The candidates are then reviewed by the eight FAA regional headquarters, which select winners for each region. The FAA passes information about the regional winners to a committee composed of about 10 people, each from a different GA industry company or organization. They then select the national winners. The award didn’t change my personal life—I still empty the cat’s litter box! Professionally, it gave me a platform for encouraging people to become CFIs and to recognize CFIs for the work they do. I think CFIs are the backbone of the aviation industry and rarely get the recognition they so richly deserve. I was proud to represent them for a year. 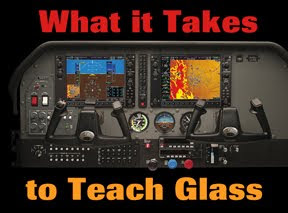 World of Flying: It is obvious you are a leader in glass cockpit instruction. What pushed you to focus your teaching in that area? Max Trescott: Working in the high tech industry conditions employees to always be looking ahead to the next future innovation. So while I was initially skeptical about the value of glass cockpits in small planes, I tried to keep an open mind until I actually flew one. When I did, their value became very clear. While they are more expensive, they greatly enhance the overall flying experience and have the potential for increasing safety for properly trained pilots. I knew instantly I wanted to be associated with something like that. 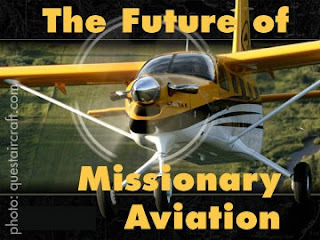 World of Flying: Tell me what the future of avionics holds? Max Trescott: I think we’re going to see more of a focus on usability. Right now, the systems are intuitively obvious if you happen to be one of the engineers who designed the system! But for most pilots, operating the systems is not intuitive and requires a lot of study. I’m sure more new features will be added in future systems, but the real breakthrough will come when the systems become easier to use. In the meantime, pilots continue to buy my books and CDs and hopefully that won’t change! You can view a Photo Gallery for this post here. Welcome to part two of my interview with Dean Siracusa, a long-time Burner who volunteers to run the "airport" during Nevada's Burning Man event. 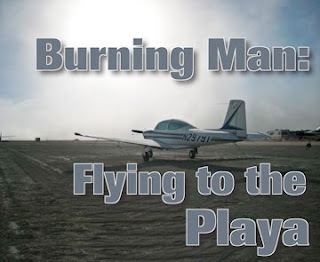 World of Flying: What kind of pilot flies into Burning Man? Siracusa: "It does take a special aviator to fly out to a remote desert location and camp in a place with dust storms and other wild weather. You've got to be adventurous and love the back-country. With the wide range of aircraft that show up though the range of pilots is very wide. Everyone from farmers to corporate and airline pilots to heads of major corporations show up to the event every year. A fair amount of flight instructors even show up so you might even be able to get your bi-annual flight review done out there!" World of Flying: Is it mostly a male pilot that flies in and attends, or couples? Siracusa: "Well, with 80 percent of the pilot population being male, you can expect the Burning Man Aviators to be of a similar demographic. But yes, there are a number of female aviators out there. They're all great pilots too. Some fly fast little Mooney's while others like Ramona Cox (aka Skychick) of Southern California fly a big Cessna Turbo 206. She's been coming out to the playa longer than I have. And, the long time head of the Burning Man airport, Lissa Shoun (aka Tiger Tiger), is also a pilot." World of Flying: What are some pre-flight tips you can give any pilot making the trip to Burning Man, and what is the "airport" like. Siracusa: "The first thing any pilot should do is go to the Burning Man Airport website. There you'll find all the important information for flying out there. It's critical to get as much up to date information before flying out there. The airport itself is made up of a bunch of great people (both pilots and non-pilots). It's situated a bit outside of the Burning Man festivities so it's usually a bit quieter when you want to get some sleep. Kind of funny that one has to go out to the airport for a little peace and quiet! You'll also want to study the survival information at the main Burning Man website. There are no concessions on the playa. No trash cans either. So, you'll need to bring everything in and pack everything out that you need to survive during your stay. The only thing out there that helps in your survival are thousands of porta-potties. The event sells coffee and bags and blocks of ice. But, that's really it. Many people have heard about the wind storms that occasionally blow through the event. Many pilots are concerned that their plane will be sand-blasted and ruin their paint. The reality is that the playa surface is not sandy. It's made of a very, very fine powder and couldn't sandblast anything. What this dust does do is get absolutely everywhere. So, most pilots seal up every vent and opening to their plane as best as they can with plastic and 3M blue tape. When they return home every metal part whether on their plane, bicycles, car, etc... gets a very thorough wash. The playa dust is very alkaline so adding a bit of vinegar to the wash water helps release the dust better than just about anything else." 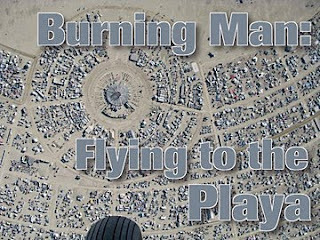 World of Flying: Blast a hole in this myth: Everyone that goes to Burning Man is a stoner. Siracusa: "I would be lying if I said that nobody did drugs out there. But, it's not nearly as prevalent as you might think. Some of the art and music is so out of this world that you can be completely sober and still be amazed by it all. And, there are all forms of law enforcement at the event. Everyone from local police, county sheriffs, state and even federal law enforcement teams are there in various capacities. Most are there because they volunteered for the duty because they enjoy the experience too. They're not going into private camps unless needed but if you're doing something stupid in public they're definitely going to have a nice chat with you." World of Flying: Are there any things to look out for while flying into Burning Man, such as anyone who might want to make a point about us burning leaded fuels? Siracusa: "The greatest thing about Burning Man is that you've got 50,000 of the friendliest people that you'll meet anywhere. Everyone is totally cool with whatever way you want to experience the burn. If you want to be naked the entire time. No problem. If you want to paint other people. Great! If you want to give people rides in your plane around the event. Amazing! The only thing you really need to worry about is people giving you things that you may not want. Be aware of food that people may offer you as a gift. It may contain some things that you're not expecting. And, most civilians have no idea what airplanes run on. Generally speaking, Burning Man is not a political event. There are some art pieces that are political but that's about as far as it goes. I promise you that almost anyone that attends Burning Man for the first time has their jaw on the ground the entire time they're there. It really is another world and you won't believe what you're seeing most of the time." If you fly cross country in the USA, you have talked to one of the National Air Traffic Controllers Association's members. Love them or hate them, those NATCA controllers got you and your flying machine where you were aiming to go, without trading paint with anyone else. What you might not have known as they were giving you flight following or guiding your IFR flight was that the person in your headset was possibly fatigued from working well past when their shift should have ended. Or, they could have been a trainee rushed through the system who was not quite ready for prime time. The working conditions that our controllers have had to endure for the past few years could have easily been avoided, had the Bush administration only came to the table. But in several blog posts such as this one, this one and this one, I continuously reminded my readers that for some insane reason, Bushie's appointees at FAA wanted no part of a labor deal with the people pushing tin through our skies. "Gee, I wonder how many controllers we could buy and train with the money spent on ONE DAY of Bushco's war, which by the way is $275 MILLION according to nationalpriorities.org. That kind of cash would go a long way towards filling those chairs at Chicago Center with trained bodies. So I propose we stop the war - just for one day, say maybe Christmas Day, which when you think about it IS what Jesus would do - and give all that money to NATCA to hire and train more controllers." 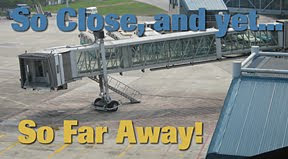 "Citing the safety board and GAO concerns about fatigue, NATCA president Patrick Forrey asked, "How much more do we have to hear before the FAA is held accountable for the blatant disregard for safety it is showing by understaffing its facilities, working controllers past their breaking points and refusing to work with us to settle an ongoing contract negotiating impasse that has created the largest mass exodus of both veteran controllers and trainees we have seen since 1981?" "The FAA and its largest union, NATCA, have concluded a challenging mediation process that has produced a landmark labor agreement. After years of strained relations, the joint decision to engage in mediation was an important first step, and today’s proposed agreement represents a milestone on the final road to settlement, which awaits ratification by union members. An independent arbitration team today released a decision on a handful of issues not resolved by the mediation, which settled more than 100 of the issues in dispute. The Obama administration recognized that not having a mutually agreed upon contract for the air traffic controllers had created an untenable situation and that ensuring the safety and efficiency of the nation’s aviation system made fair resolution a must." While this technically is a tentative agreement, I am assured from some of my NATCA contacts that accepting it by the membership is a slam-dunk. So the next time you as a licensed pilot wants to stand up and shout rude disruptive comments about Barack Obama's health care reform plan, or want to paint swastikas on Democratic politician's office buildings while wearing your flag pin (as if it's better than mine), remember that your guy made it clear he wanted no part of airspace safety. As long as the flaming bodies raining down on Crawford didn't take out any cattle, he was good. Say what you want about our exploding deficit, but Obama came through for the aviation community when the Cowboy could not. And yes, with this NATCA agreement, I am elated to close an ugly chapter in our country's aviation history, and vow never to type Bush's name again. He has now officially became irrelevant in my world. As I sit here in the Outagamie Regional Airport (KATW) waiting to depart Wisconsin after two days of sun and fun at Airventure, I am reflecting on many things that I have seen and done in the past few dozen hours. EAA's Airventure Oshkosh is a mega compilation of all that makes our general aviation world so unique and special. It is the joy of seeing beautiful new flying machines and museum-quality vintage birds up close. It is the camaraderie of rubbing elbows with the best quality people on the planet. And, it is wandering jam-packed exhibit halls gawking at everything from the latest avionics to the all-in-one airplane repair tool/flashlight that fits in your flight bag and can slice and dice kumquats, open an MRE and allow a Missionary pilot to rebuilt his engine while stranded in the Amazon jungle. And speaking of Missionary pilots, I met one on this trip that exemplifies all that makes the pilot community so special to me. You know about Missionary pilots, those adventurous men and women that fly Cessna 206s, Helio Couriers and now the Quest Kodiak into tiny remote mud strips carved out of the side of a hill in a "one way in, one way out" canyon deep in the most exotic corners of this Earth. Their work often goes unnoticed by many outside of aviation, but it is these courageous sticks who sometimes make the difference between life and death to native tribes that have no other contact with the outside world. As I tried my luck with United Airlines flying commercial to Oshkosh last weekend, I got as far as ORD in Chicago when my luck ran out. The last plane of the night – a Mesa Airlines quick-hopper up to KATW – had been delayed a few hours, and the full flight, made up of mostly aviators trying to get to Airventure, was getting restless after two gate changes. But when the Gate Agent announced our flight had been canceled, we 60 or so Oshkosh-bound customers were at that point screwed. When they made the announcement that we were not flying to ATW tonight on any airline, and with no car rentals left anywhere in Wisconsin, our options were running out fast. We all were herded to Customer Service and began waiting for the bad news. We were not getting to Oshkosh in time for the opening day on Monday. I was standing next to a tall gentleman and while not trying to listen in to his conversation, his phone and my ear were maybe 24" part. I heard him arrange to have a van come all the way from the Oshkosh area and get him. When he hung up, I quickly apologized for accidentally overhearing his conversation, but told him if he had any room in the van, I'm in for as much cash as he needed if he could get me to Oshkosh that night. He had five seats left, and I jumped on one. Problem solved. 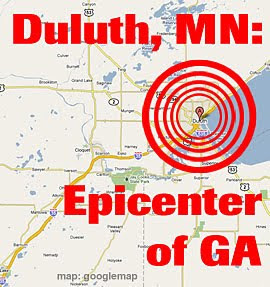 Turns out the van's drivers were actually coming from Wautoma, WI, about 40 minutes west of Oshkosh. Their drive to ORD would be well over four hours, so we had plenty of time to kill. And I used that time to make friends with the man who arranged the van, Dave Voetmann, who happens to be one of the "Co-Visionaries" of Quest Aircraft, makers of the Kodiak turboprop. Also along in the van were other complete strangers who became fast friends, Gary from Santa Monica and Joe, an international 767 Captain for United. And yes, Joe made it crystal clear that it was Mesa Airlines that should be cursed this night and not his employer. A tired looking but capable Cessna 206 loaded 200 pounds over gross is lumbering along up a remote canyon in the Amazon. Low clouds obscure the steep cliffs just off the wingtips, and without GPS or even a working VOR station, navigation is out the windscreen. Inside the plane are boxes of bibles, medicine, food, trading trinkets and even a few live chickens. Flying the plane, Voetmann slows the plane to near stall as he descends around a blind corner, dancing with the Devil as he must stay fast enough to remain airborne, but slow enough to make the approach that lay ahead. As he and the 206 rounds the turn, a short muddy "strip" cut literally by machete out of the jungle is seen, and he sticks the plane on where the numbers would be if this kind of remote strip HAD numbers. He stands on the brakes, the live chickens freak out, and as the prop stops, the native people emerge from the trees to welcome him. After offloading his cargo and refueling from barrels of avgas that had to be trekked into the strip on the back of animals or in some sort of wagon, he points the prop out of the canyon and performs a dramatic max performance takeoff to clear tall trees that mark the "perimeter" of this "airport". Dave Voetmann and his fellow Missionary pilots will do this same type of edge-of-your seat flying tomorrow, and the next day, and the next. He has done this for years, and for decades. Today, the company he helped to birth is hoping to deliver thousands of very capable Kodiaks to his brethren around the world, allowing them to haul more, go farther, and do more of God's work. The idea is simple, take some of the profit from every nine Kodiaks delivered for commercial use and use those funds to reduce the cost of the 10th one to near cost for delivery to the many Missionary groups waiting in line for this extremely capable aircraft. The way this van trip to Oshkosh developed, and they way we wayward flyers came together as quick friends to pool our cash and made the trip happen is what flying is all about. I don't believe I have ever met such a colorful, generous, more respectable man that Dave Voetmann, he is just a class act in every way. The number of people this man has helped around the world cannot be counted, but I promise you this: Not one of those native people who have met one of his mission flights in a jungle far from civilization will ever forget this skilled but honestly humble pilot.